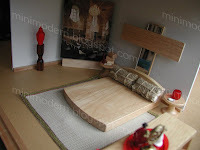 This is another bedroom in the 360 dollhouse. 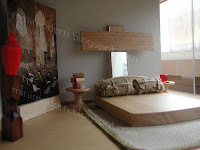 The bed is supposed to remind one of a pew while the pillows pay homage to a manger. There's something about this mini scene that makes me think of the books turned movies Carrie and Flowers in the Attic. 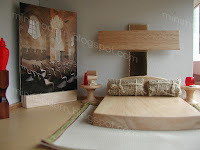 The mirrors for the cross, the platform bed, nightstands and dresser all came from children's dollhouse furniture sets. The rug is from the AG Minis sets. The red urn is from the Kaleidoscope House accessories. The art is an image of the St. Bartholomew's Church in the Czech Republic. I am often asked how long it takes for me to put rooms together and I'm typically not sure. For this particular scene, I spent 15 minutes. Love the site re-design! If you are looking to tweak the right column layout you could reduce the line-height and font size in the sidebar styles. Drop me a line if you need any help with the editing the HTML. 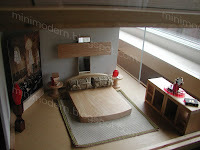 That's what I do when I'm not searching for modern dollhouses. Bizarre. Cool. Can't wait to see what is next.